If this were a war movie, dramatic music would be playing right now. I do not care for the lines in your sample. I really have fallen in love with this comic, and part of that is how your art has evolved into what it is currently. I am not saying that changes are a bad thing, but I think your sample is a step backward, or at least in an unappealing direction. I wouldn’t recommend the new style, it just looks sort of sloppy. No offense. Stay with what you have now, it looks a lot better imo. This is the first time Selkie has gone all out…heck, it’s really the first opportunity she’s ever had to go all out. Sounds like Selkie is having a little gill backup. As for the sample, I think it looks good. More of a fluid style in my opinion. Just found this comic, spent the last couple hours catching up (instead of the ridiculous things I could’ve been doing, like homework). Wish I had something creative to add instead of “fantastic, keep up the good work, & I love the MLP/Ico/Pretty much everything else references”, but I don’t. For the alternative style, I wouldn’t use it as the main comic style. It’s a bit dreamy-looking, as opposed to the more in-the-present current style. In future dream sequences, flashbacks, fantasies, etc. though, it would be more in its element, I think. I agree with this. I think the alternative style is cute, but I prefer the style you’re using right now. I am with the above comments. I like the way the linework is going thus far. The doodle isn’t really my taste. That said, it is your comic. Personally though, I am a wee bit more concerned about her sudden difficulty breathing. I think that picture you have as a sample is fantastic personally. It gives your comic it’s own style. Don’t take this the wrong way, but having your comic less defined with the lines would be a good thing for you. You should experiment with many different styles as you grow as an artist. It doesn’t look sloppy at all, it’s a different style I truly think you should try. I think the loose outlines would improve your art style, though it’s hard to tell without actually seeing a whole page done that way, preferably side-by-side an “old-style” version. The reason I think it would improve is that your webcomic (among others) has what I mentally term “uneven detail levels” (THunt’s goblinscomic would be another example – mind you, he has a lot of loyal fans as it is). See e.g. your page 360 – e.g. the hairlines are very detailed, you use some shading, yet the kitchen appliances have almost no detail. By giving up some detail on your outlines, your overall detail level would probably become more even. It might also help your scenes become more dynamic as your outlines become free to express movement and possibly emotions better. But ultimately we’ll only know if you try! well said! I totally agree. It’s probably that she needs to go flush her gills. If they sent an email to the teacher, it’s probably a daily thing and just happened to hit at the wrong time. Aquatic asthma… interesting. I suppose that would be a problem for a fishling like Selkie. I know that was covered in previous chapters but it is still an interesting subject matter. You have to wonder if there is a cure other than flushing with water. Eeep. looks like Selkie can’t keep up the activity in a dry environment. …what is Selkie doing to that ball in her hands? Is she biting it? Or is she just getting winded, and gets hit while she’s trying to breathe? It’s sad that she does get hit, but realistically it would have happened sooner or later. At least she got to feel good about gym class for a while. I don’t like the look of the sample picture – like someone said, it looks sloppy, more like a doodle done in 5 minutes, than artwork fit for a great comic. It’s difficult to judge how it would look as an entire page, but personally I don’t care for it. I like the style you have for Selkie at the moment – if you have to utilize that style, do so for the unimportant background characters, like the dark-skinned boy/girl in the first panel. She’s probably out of “breath”. She has gills, so it makes sense she would need to get water through them every now and then. If it is daily when she’s never really run around actively (because of not having comfortable shoes), then it’ll probably be more often when she’s pushing herself, like playing dodgeball in P.E. Poor Selkie D: perhaps she can wear a water helmet ala Sandy Cheeks when she plays sports. Her gills are basically her lungs, and in my understanding the air goes through nose/mouth and out through the gill openings on her sides. At least that’s how her “gill flush” seemed to work in the comics where she was newly arrived to her new home. Okay, so that hit on or around her shoulder, so her actual gills didn’t take the impact. Good. Oh no! Poor selkie! As to the art style, it’s never really mattered to me if the storyline is good-and yours by the by is fantastic. =) I’d say experiment away you can always return to this style. Might get haters for saying this but I like the doodle. I think it could use a little more definition but in my opinion it looks more distinctive and fluid. The comic as it is, as much as I love it Dave, screams amateur from an art standpoint. the doodle looks like something that I can see being printed professionally. Having said that I might just be enjoying a different take on Selkie, this may not work for everything else. I recommend doing an entire sample comic this way when you have time. So we can all see how it looks overall. I agree. I think it may need a little refinement, but if you don’t draw in it, it won’t be refined. I also agree on the current style; however, it’s not unheard of for people to improve exponentially (see: Questionable Content. Strip 1, then skip to today? OMG). Even though the drawings now are currently rough, I can already see improvement from the first comic. Drawing is like working out. You have to do it every day, or else you’ll get out of shape. tl;dr: I like the doodle. I’d like to see a few (not one) pages done in it. I like the sample! Makes it distinctive; it stands out. I dig your doodley idea! It’s so cute and stylistic! I don’t have a preference about the art either way. I read this comic for the excellent (and incredibly original) storyline; I don’t see the ‘artistic’ component as the most critical factor here. Maybe it’s because I can’t draw anything better than a stick figure, but I think Dave should be applauded for his ongoing attempts to improve, even though I like his art just fine. It’s all about experiment- go for it, and if it doesn’t work out, go back. Do what you think will further your art style, and if it turns out to be a false lead, you’ve lost nothing. The sample is cute, but only as a sketch. I don’t think it would be a good style for a comic. What I find interesting is watching your art evolve slowly over time. It seems like you keep trying to force change when you’re already improving simply through constant practice. I like it, but it’s really whatever you’re most comfortable with! The new style has a certain personal flare that I really enjoy. In fact, it kinda reminds me of the drawings Calvin and Hobbes, which is why I like it so much! But like I said, it’s up to you! I agree with Romano Giovanni, Lihes, and mugoi_usagi. I prefer your current style over the one in the sketch. Also, I hope Selkie will be OK. Her sudden difficulty in breathing is a bit disconcerting. That might just be the combination of being out of breath (she probably isn´t used to running around) and having sticky gills; or being out of breath exacerbates the sticky gills, as the latter are caused by breathing air for a long time. 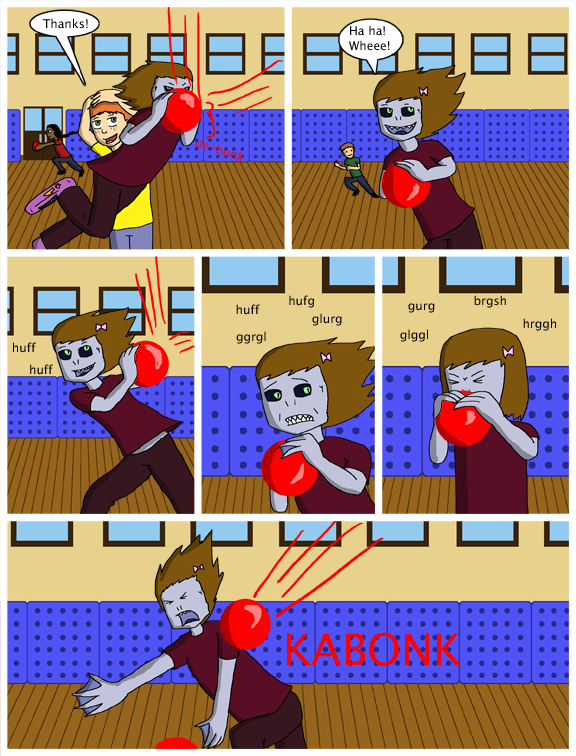 I´m more worried about her expression in the last panel – she never looked like that when she got a ball to the head, in this one only his her shoulder. BTW, I prefer the current art style, too – but I also like the suggestion of using the loose style for dream sequences, flashbacks and the like. Huh I didn’t notice that until now. I wonder if there is anything unusual about her shoulder on the physiology diagram. I kind of like the new style. It sort of makes it feel like a child (maybe Selkie) is drawing the comic, which is adorable! Heh, I can just see her telling someone of her time with her new dad, using that style of art. I wouldn’t want to see it as the comic’s totally new direction, but Selkie’s thoughts/memories/dreams would indeed work, since it’d be her doing the “storytelling”. I hope she’s just out of breath and not unable to really be active… of course if she can’t be active on land it’s likely she’s just UNGODLY in the water… when she gets older she could be captain of the swimteam! Yeah you’re probably right :(. I mean Selkie would be naturally gifted like any good swimmer so it shouldn’t be a big deal but there is unfortunately more than one Amanda in the world. There’s also the fact that swimming teams usually practice in swimmin halls, where the water is, more often than not, chlorinated. I doubt that’d be good for her gills, seeing how she complained about the metal bowl making her “gill water” taste metallic back at Todd’s. Yeah, from what you’ve established about her physiology, her gills will need more frequent flushing / hydration when she exerts herself. And it’s believable that she and the orphanage staff didn’t realize this beforehand. In the long run, I wouldn’t think it a more serious health issue than the kind of asthma that requires some kids to carry an inhaler with them. And when puberty kicks in and Selkie starts to literally hit her stride physically– watch out, world! I actually think I prefer the new style; I would love to see an entire page done the same way. Even if you don’t end up going all the way in that direction artistically, I think there are aspects of it that are worth exploring. Okay, you’ve drawn this long-time lurker out to comment on today’s strip. From the ‘sound effects’, it seems like Selkie’s gills have dried out or clogged up, and now she’s having the equivalent of an asthma attack! Poor kid. 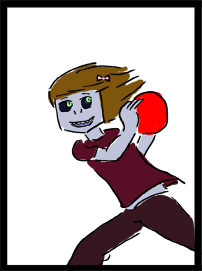 And to be clobbered by a dodgeball right then… I foresee mixed reactions from her classmates. Her friends are going to be freaked out when she probably falls over in the next update. And when they find out what happened (some of them are probably unaware that she even has gills), it will be a painful reminder that she’s Different, differences running more than skin deep, and may well make for awkwardness for the next few days. And at least one bullying type (coughTonycoughAmandacough) is going to loudly accuse her of just faking it and trying for sympathy… and probably won’t change his/her tune even when Selkie’s new dad comes rushing to the school and takes her home for the day. As for the new sample, I’m probably the last person you should ask for an opinion about comic art, as (a) I can’t draw worth a darn myself, and (b) I tend to read comics for the subject matter and style of humor, not the art. I’ve perused and then passed by many webcomics that were drawn beautifully… and I obsessively check daily for updates on The Order of the Stick! 😀 But what the heck, I’ll say something about it anyway. At first I didn’t like it and thought it was a step backwards in artistic development, but after a few moments of thought, I realized that my reaction was based on (a) the sample having no background, which automatically made it look more primitive, and (b) my instinctive dislike of things changing. Yup, I’m one of those Status Quo freaks who tends to think change is scary. (Hey, at least I recognize it and admit it.) The more I look at the sample, the more the new style is growing on me. If I may make a suggestion, though it will involve more work for you: instead of just one panel of today’s strip for a sample, if you completely redraw a strip from a few updates back (something with at least two recurring characters in it) and then provide a link for looking at the pages side-by-side, readers will be better able to judge whether the change is an improvement. As for the new art style… honestly, I’ve seen people using it before and I never really cared for it. But I have a little idea for it. Maybe it can be used for action sequences? Like when characters are running, are in a rush, etc, etc. Poor Selkie. She’s worked her gills and lungs too hard. To the people who have commented negatively about the sample sketch: Seriously? What do you know about art, really? One thing I hate about comics is that most of them are so tight and polished. Every stiff, awkward pose is solidified and there is no fluidity. Especially with new comic writers. The readers really shouldn’t have input on how the artist’s style progresses, it’s necessary to experiment if one wants to get any better. Take these two pages by Sarah Ellerton as an example: http://inverloch.seraph-inn.com/viewcomic.php?page=3 and http://requiem.seraph-inn.com/viewcomic.php?page=791 The first is from the beginning of her earlier comic Inverloch, the second is from the end of the Phoenix Requiem. Note how flat and strangely-coloured the first is, and how much movement and volume there is in the second by contrast. The writer’s art must develop over time and not be staunched by every nay-sayer with a mouse who is afraid of change. Fred Gallagher faced a great deal of criticism when he broke away from drawing his comic Megatokyo in a sequential four-panel style to experiment with a multi-paneled more storyline-based format. This http://megatokyo.com/strip/1313 is what his art looks like now, compared to this http://megatokyo.com/strip/2 when he started. While I could go on to detail the progression of artistic skills of most of my favorite webcomic writers, that would take way too long. All I can say is that I hope to see some experimentation and exploration of other styles (and perhaps, a different colour pallet?). 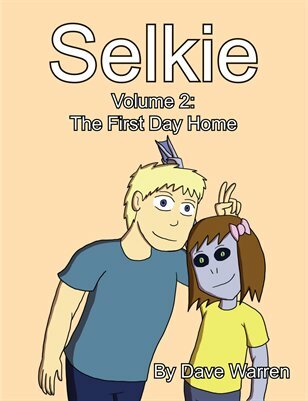 Admittedly, I don’t read Selkie for it’s art, unlike webcomics like Lackadaisy (a charming prohibition era tale of a speakeasy http://lackadaisycats.com/comic.php?comicid=1). However, there is nothing I like more than to see people progress and grow artistically. By all means, Dave, start using freer lines. You can always tighten things up later on if it doesn’t work out. I much prefer the sample sketch. Really? I got to it just fine. Turns out I was still logged in to Deviant Art. Logged out and see it fine now. Two words: Questionable Content. Biggest improvement in web comic history. QC has improved so much, I know. I was going to cite that too, but I still feel the art could (and should) improve a great deal more. Also, I didn’t want to overload people with too many links. Right behind you artist! I think you make a marvelous point. And what do you know about us, An Artist? Not liking the style of the sample does not make us “nay-sayer[s] with [mice] who [are] afraid of change.” We just do not like it. However, I do like Coco Gash Jirachi’s and Hanna’s ideas for using the style to depict movement and/or Selkie’s thoughts, memories, and dreams. Furthermore, Hatter is correct in that the more one works on anatomy, the freer the lines will become. Forgot to say this earlier, sorry; I’d like to share the drawing in a news post as a Fan Art, for those who may not read comments. That okay? Sure, you’re welcome to do so if you wish. I really enjoy the new sample style. It looks much more artistic and comfortable. It’s really unique and it suits you better than the current style. I love the comic, but to me, the neat, polished style of lines and coloring doesn’t look like it fits the simplicity of the composition of the panels. The sketchy style is much cooler! Honestly, I think the decision on the direction of the art design should be the artist’s; it’s cute that you care about the opinions of your fanbase, but this is your webcomic, and you should be allowed to experiment with the art (as opposed to print comics, which require a bit more consistency from page to page). Readers like the current artstyle (myself included) because that helps provide the feel for the characters, and the story, and a new style changes that. I’ve seen many webcomics where the art changes direction, and the fanbase is initially distressed, but quickly learn to love the new style, as it provides a new lens in which to view the characters. And I hope not to push you towards implementing the new style, either; I am perfectly content with your current style. I just think that you, as the artist, should make that decision, not us. After all, we only have a biased view of this world (what YOU show us! ), so it is up to you to maintain the art in such a way as to reflect the mood of the story. The story is still top notch, and we will continue reading regardless of your artistic choices. That being said… maybe you could use different styles for different types of scenes. Perhaps the “doodle” style could be used during dream or fantasy sequences, with the current style used the rest of the time. Those are my two cents. Well said on the different sequences. “Cheap Thrills” used a sketchy style really nicely in the second chapter for flashbacks. Posting again. I might sound pretentious here so please, please don’t be mad. I’m an art major and I fully believe you should go with the new look. Embrace it and make it your own. It’s not sloppy in the least, again, it is a very distinct style. As someone above stated, your current art is amateur level (Please don’t get offended! It’s amazing how much you’ve improved thus far!) and I believe you should experiment with many different styles until you find one that just… clicks. Clicks with you mind you, not with us. You should never change something you feel is what defines you. I really see a bright future in your work though if you try out different styles and keep making improvements! Your story is well told and heartwarming, so art is secondary to the comic, but I think you should try many things that you feel is right. Go with what your gut tells you to do Dave! And in the end, don’t let anyone force you into making a choice you don’t want. Actually, I love the new style. Definitely try it out! My childhood strategy for dodgeball: get hit as soon as possible. Then you were out, and could go sit down. Experimentation is part of growth as an artist. I’m an art school grad, so I’m always doing the art critique thing in my head while reading the comic. Since you’re obviously still learning I haven’t commented on it. Quite honestly, the story and writing are so solid I don’t mind the art that much. Drawing every day and trying out new styles until you find one that works for you is the best way to learn. So go ahead and try out the new style, tinker with it, pick out the things you like about it, drop the stuff you don’t… It’s all good. As long as the story and characters are still good, we’ll stick around. You’ve already come a long way from the first pages. My feedback on the alternate-lines sample is that it’s like LICD Beginnings vs. normal LICD: not bad, but It’d fit in another storyline. I have a question for those who have commented on the comic’s art looking amateur-ish. Is there anything in particular about it that gives that impression? Again, I didn’t mean to offend you. I’m really sorry. Mostly the line work. While it’s solid and you’re improving, as it is now, it looks stiff and unnatural. The new line work you sampled looks fluid and playful and I personally feel the bigger and bolder outlining line gives it far more definition than the skinnier outline you use now. Also, the coloring looks more natural in that sample. Although you do very well with how you color and shade now, it has room for improvement. The dimensions and depth is in need of some work too. I promise you, I am NOT trying to insult you. I used to be at the same level as you were and it took years of experimentation and practice to make my own styles and techniques. With the heartwarming and playful nature of your story, I feel the current style doesn’t reflect it as much as it should. You have so much talent and potential and I eagerly watch as you develop and change through the comic process. That’s why when you offered a new style, I was excited and dearly hoped you would consider it because it’s one of the first steps in furthering your potential and journey as an artist. I’ve been moved by your comics story, Dave. Seeing your grow as not only a story teller, but an artist as well just… I know you’re going to be great. The fact that you made a webcomic and stuck to it faithfully tells me you already have the drive to become an amazing artist as well as a writer. You’ve only just begun and you’re improving with every page. I can’t give you a clear answer on why I chose the word amateur and I apologize for this. I suppose I said that because you reminded me of when I first started out. Overall, I just want to say, I hope you continue this comic and once you’ve finished telling Selkie’s story that you create a new character’s story for us to love. The sample style is cute, and I like it very much, but I’m curious how the gaps in the linework will interact with a background. The new style imparts a lot of motion, and also space to my eye (which, as mentioned above, makes it an excellent choice for dream sequences which don’t always have a lot of definition or even solid settings). In response to your question about the art being “amateur-ish,” I think I see what those folks are saying even if that might not have been my word choice. It’s hard to pin it on anything in particular… I would say maybe the predominantly flat colors, but the sample sketch also has flat coloring. Maybe it’s missing a sketch-like quality, but that doesn’t make it amateur-ish :/ I’m not being very helpful, am I? Either way, I appreciate the simplicity of the art style, and the story is extremely well done, so go with what your gut says 🙂 Thank you! The sample style is cute, but when people have been following a comic for a while they come to have certain expectations from it. Your art style is part of your brand identity. If you change your art style too much too suddenly, it takes away from that, and also disrupts their immersion in the story. When they see the switch-off point, they’ll stop thinking about the story and start thinking about the sudden change in art. Actually, I dig the new style, but I seem to be in the minority. Anyhow, keep up the good work! The new style is nice, but I wouldn’t recommend switching to it for this comic. When someone reads a comic for a while, they come to have certain expectations from it. Your art style is part of your brand identity. If you change the art style too much too suddenly, it takes away from that. It’s okay for the art style to change, but it’s preferable for it to happen gradually and organically as your drawing skills develop and evolve (we’ve seen some of this with this comic already, if you compare the first pages to the recent ones). Suddenly drastically changing the art style without it signifying some kind of change in the story (like a dream sequence, flashback, change in point of view etc.) will also break the readers immersion in the comic (temporarily). They’ll stop thinking about the story and start thinking about the change in art for a moment. There’s also the (for lack of a better word) character that certain art styles have. The new style resembles a children’s picture book. This is not bad, but children’s picture books are known for having short stories with less emotional depth and complexity than other stories. In addition, it can be compared with those other books, so you run the risk of readers making a “This is like” connection. Again, this isn’t necessarily bad, but the current style is unmistakably Selkie’s, and undeniably yours. The current style has also developed with the story. The different parts of this comic have, so to speak, grown up together. I can’t really speak for others, but if you stop this art style now, I, at least, will wonder how far it could have gone, how much it could have developed, and what it could have grown up into. I really like seeing your work evolve naturally. If you look at the first pages you can see how far you have already come. That being said, this is *your* comic, as the creator you must do what you think is best for the story. Hooray, she’s having little fishy asthma. Also, I’d like to add, it’s your comic, experiment with different art styles to your hearts content. At the end of the day this is your project, I am sure whatever you do, the readers will adjust. I love your work as it is. DON’T CHANGE IT. It would corrupt the essance of Selkie as it is, and I love it already! Though, it could be a fun style for a new comic. It’s too bad you can’t do something like they do at leasticouldo…. you know, do the main storyline/art style through the week, and “special” updates/art styles on sundays, or another day of the week..
That new art style seems it would be wonderful for Selkie having a flashback. Keep posting experiments, never know when something will stick. I’d have to agree about the newer style not being to my liking for the main comic pages … but I do really like Dri’s suggestion for “flash-backs” or dream sequences? Maybe try doing something with more line weight/variation, rather than one standard-width line around her? It tends to make the art feel more active if you do it properly. If you’re using a tablet, just play with pressure sensitivity settings.